Learning the history of a destination helps us better understand the principles on which it was founded. In Knoxville, we only had one day to gather all of the historical knowledge that we could absorb. 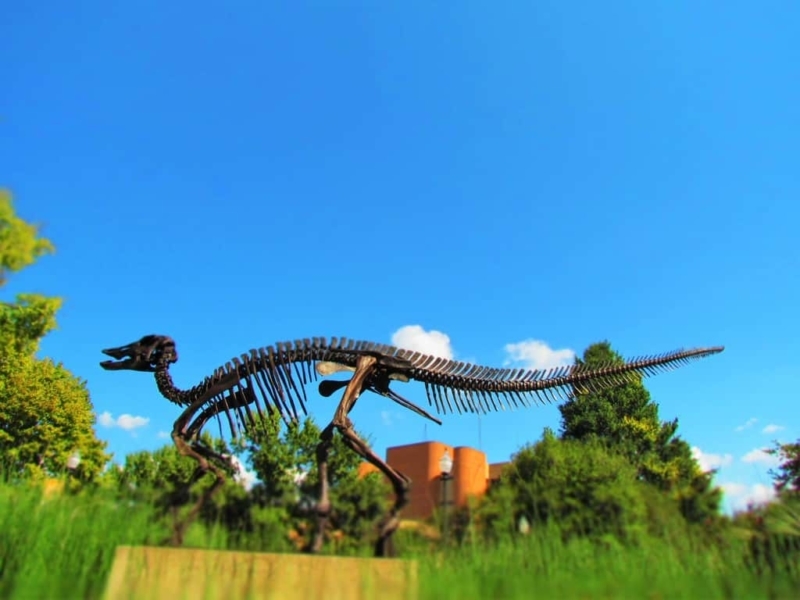 A stop at McClung Museum of Natural History & Culture would certainly assist our endeavor. 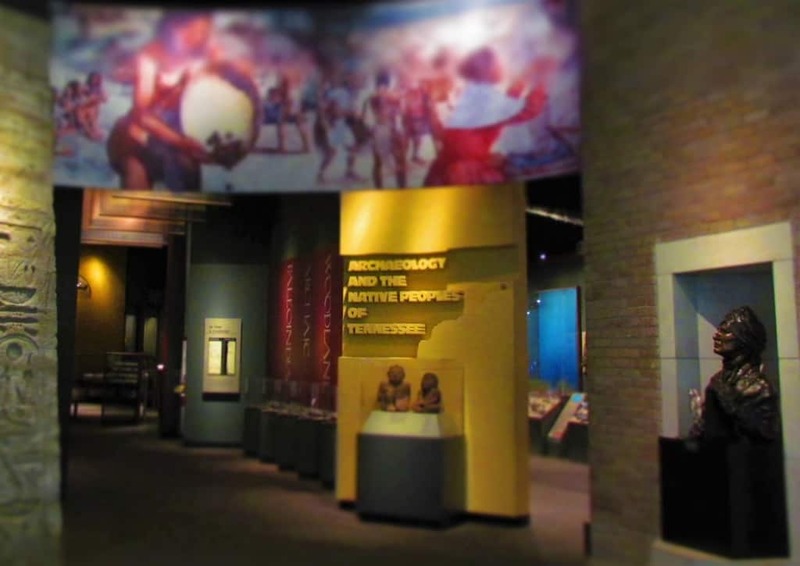 Located on the campus of the University of Tennessee, this educational museum is free to the public and designed to appeal to all ages. Our visit was in the Fall, so the campus was a beehive of activity. Even with an upcoming football game rally in the works, we were still able to find a free parking spot close to the museum entrance. We had scheduled to meet with Zack and Catherine, who are museum staff members. The plan was for a brief overview, to help us get our bearings, before we set out on our own. They walked us through the galleries, pointing out some of the uniquely Tennessee historical artifacts. 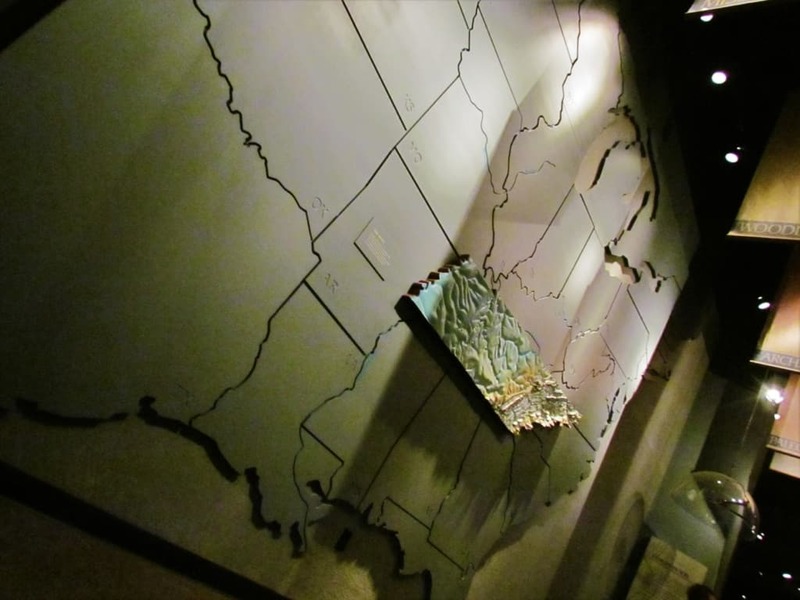 While the McClung Museum covers a wide range of historical periods, most of the displays attempt to connect the events with this region. The layout of McClung Museum is designed to fit in the available space. The galleries don’t run in chronological sequence, but visitors will eventually see the complete timeline of history for Eastern Tennessee. For this article, we will attempt to stay somewhat to the course, and show the galleries from earliest to present. I’m going to let you in on a little secret, Crystal is not as big of a history fan as I am. While I can immerse myself in most all of the displays, she prefers to spend her time with the human interest side of history. The McClung Museum exhibit on geology & fossils wasn’t quite her cup of tea. This educational museum covers a wide range of the subject, with artifacts and informational displays. It was an added bonus to learn more about the duck-billed dinosaur, like the one we had met at the entrance to the building. We continued to explore the galleries at McClung Museum, and explored the Human Origins exhibit. The space is designed to display a comprehensive overview of humans. Sometimes we forget that we are just one of the millions of species that inhabit the Earth. This exhibit is designed to put the human species in context, by showing the similarities and differences with other mammals. Be sure to check out the ceiling installation, which involves a replica of a painted cave wall from France. Moving ahead in time, McClung Museum next focuses on life and art in ancient Egypt. For a university space, we were quite impressed with the amount of artifacts they have from this period. Egyptian history has fascinated us, and we always look for an opportunity to see more pieces from the time of the Pharaohs. The culture of the people who inhabited the Nile River Valley is intriguing to many, which is apparent in the number of special exhibits that routinely travel from city to city. (Read about an Egyptian underwater exhibit we visited.) This Knoxville educational museum displays a variety of statues, carved reliefs, and objects that were used in daily life. This museum was our second historical stop in Knoxville. Earlier we had visited James White’s Fort, which supplied us with some background on the founding of the city. (You can read about the fort here.) 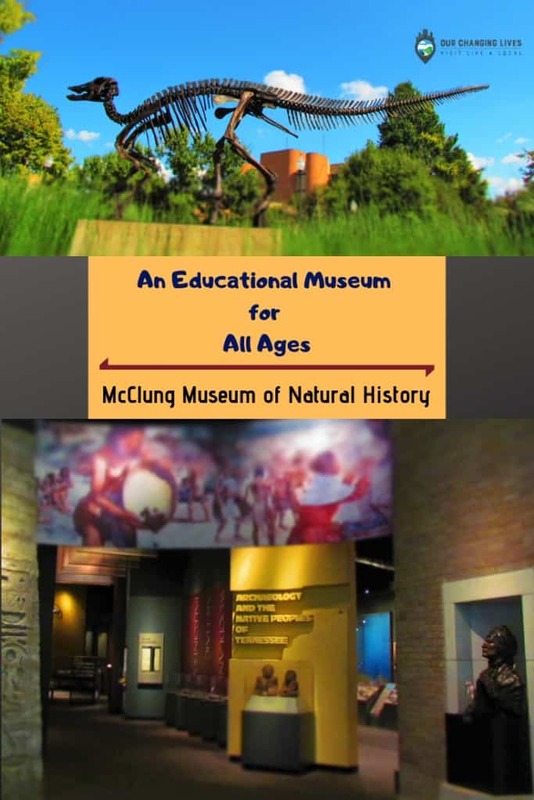 This educational museum is named for Frank McClung, who was a descendant of James White. In 1933, the Tennessee Valley Authority had devised a plan to supply power to the region. In anticipation of the various sites that would be affected by the plan, excavations were conducted at 62 sites across the state. Eventually, the three-story museum was constructed to offer a permanent home for the artifacts. The Archaeology & Native Peoples exhibit focuses on the people who have inhabited the region. The displays are broken into five periods of history. Each period is filled with artifacts and information about the culture during the distinct times. The earliest periods (Paleoindian and Archaic) includes tools used to hunt and butcher creatures like the mastodon, which once roamed the area. During the Woodland period the native people began engaging in gardening, which allowed the development of communities. In the fourth period (Mississippian), the communities continued to develop culturally. A variety of Native Indian tribes lived in the region, with some constructing elaborate villages that included effective defensive systems. The Historic period is the fifth and most recent time period in this exhibit. By this time, the only permanent Indian tribe in the area were the Cherokees. Besides the various artifacts, there is another feature to this gallery that we found fascinating. On the walls, there are five full-size murals by Greg Harlin. These works, from the nationally acclaimed artist, present moments in time from the Native Indians who populated the region. The exhibit ends with information about the Trail of Tears, which included the removal of the majority of Cherokee in 1838. On November 29, 1863, the Battle for Fort Sanders was fought in Knoxville. Seeking to prevent the loss of railroad access to the Deep South, the Confederate Army attacked Union forces in an effort to retake the city. McClung Museum has a small but unique collection of artifacts from the historic action. Confederate troops proceeded with a poorly planned assault that resulted in a lopsided victory by Union troops. Artifacts in this exhibit include a drum found in the Confederate camp and Frank McClung’s pardon signed by President Andrew Johnson. An added benefit of visiting educational museums is finding topics we had not been aware of prior to our visit. Little did we know that the Tennessee River has been a supply of freshwater mussels for ages. Excavations show that Indians were harvesting the aquatic creatures for food as far back as the Mississippian Period. The shells were used for scrapers and hoes, while the freshwater pearls were used for eyes on their animal shaped pipes. By the beginning of the 1900’s, Knoxville had joined the pearl-button industry with their bountiful supply of mussel shells. An interesting side note is that the freshwater pearl was named the state gem of Tennessee in 1979. Once again, we found that we were leaving with knowledge we gathered during a visit to a new destination. 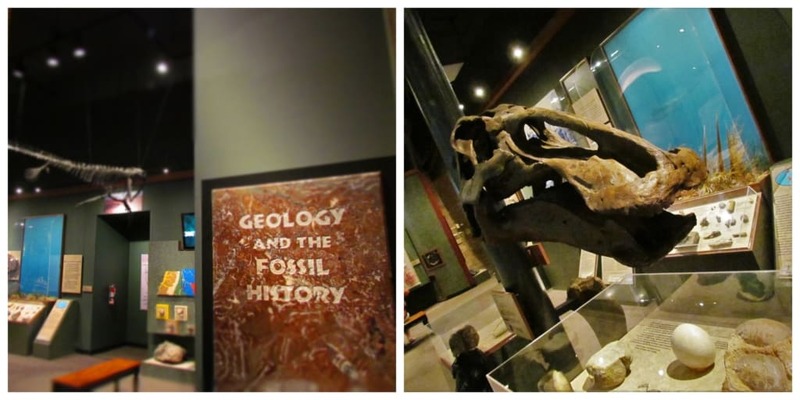 How many of you enjoy visiting educational museums like McClung Museum in Knoxville? I have to say I’m usually not one for museums, but this one did pique my interest! Knoxville is an easy weekend trip and I definitely want to go to the McClung Museum of Natural History next time we’re there. Patti, We hope you get a chance to visit. Just don’t do like we did, and stop by on the day of a home football game.